As the air cooled with the advancing eclipse, the large cloud shrivelled away and out came the Sun, bathing the landscape with the distinctive golden hues of a pre-totality eclipsed Sun. It was now obvious that we were going to have an unobstructed view of totality. I began this trip with three days in Kampala, the capital of Uganda. I learnt how important prefixes are in many African languages. The GANDA tribe gives us Buganda (the land), Baganda (the people), Muganda (an individual), Luganda (the language) and Kiganda (the customs and traditions). I used local transport to visit the Gadaffi Mosque, Namirembe Cathedral, the Buganda Parliament, the Mengo Palace, the National Museum, the Kasubi Tombs, the Owini Market and several Indian temples. I booked two safaris and my driver's name was Fred. Actually it was Niwagaba. He is not a Muganda but a Rukiga from the South of Uganda. We drove to Murchison Falls National Park where I would enjoy some wildlife drives and a boat ride along the River Nile. I stayed at the friendly Pakuba Lodge, overlooking the Nile. At night I had to be escorted to my block because animals had been known to come close by. As the manager put it: "I saw a leopard asleep here once". The lodge slowly filled up as the day of the eclipse approached. I met a group of science teachers from an international school in Kampala and Charlotte who writes a blog about Uganda. The night before the eclipse it rained with thunder and lightning for several hours. Eclipse day began clear and sunny. The Minister of Tourism, Margaret Mutagamba, was staying at the lodge and I was introduced to her over breakfast as "our eclipse guru". I showed her my eclipse photos and maps and Charlotte took our photo together. 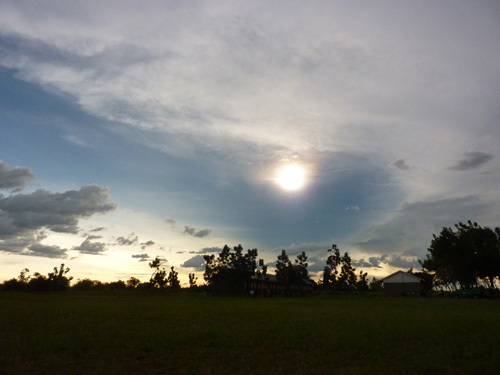 The lodge was the closest in the national park to where the eclipse was going to be total so the drive to the village of Pokwero was quick and easy. Fred and I had been joined by Charlotte who appeared to know many people in the tourism industry including Fred's boss. There was a festival atmosphere in the village as thousands of visitors had arrived. Security was tight as the President was due to see the eclipse from Owini School in the centre of the village. 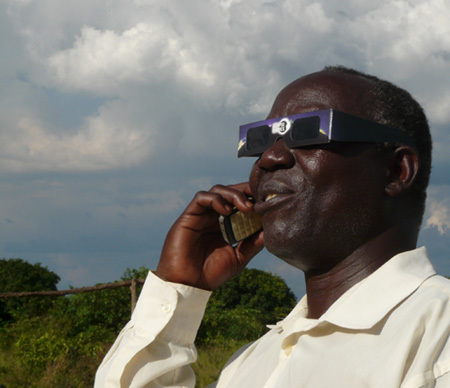 I was interviewed by Channel 44 Television about the eclipse and why I had chosen Uganda from which to view it. After being screened and searched, we entered the school and watched a bit of dancing and singing. A small group of us drove 1.7km to the East of the crowded and noisy (but very lively) village to another school playing field. That morning I had received an email from Lukasz. We had met up at previous eclipses (China in 2009 and Australia in 2012) but we had never actually seen one together. It was now time to rectify this oversight. The location was flat, quiet and rural. We were a group of about a dozen with a few local people. The Partial Eclipse began well with the bite from the Sun visible through our eclipse filters. More detail could be seen through a large school telescope set up by John for eclipse chasers and locals to view. About half way through the Partial Eclipse a large cloud covered the Sun. The Sun did peek out as it moved across but then several clouds combined to block the Sun. The light dimmed and we could see the Moon's shadow approaching from behind where the Sun was. 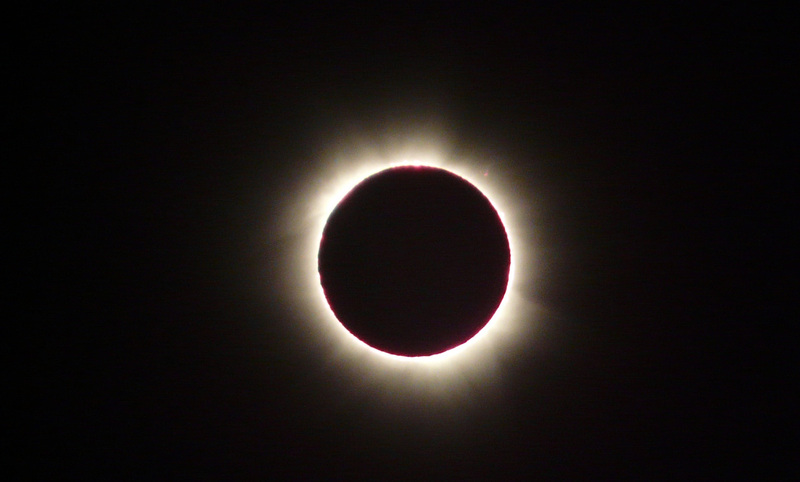 Totality came and thrilled us with a wonderfully bright corona and red flames dancing around the edge of the Sun. The locals gasped with awe. One man was dancing a jig with delight. 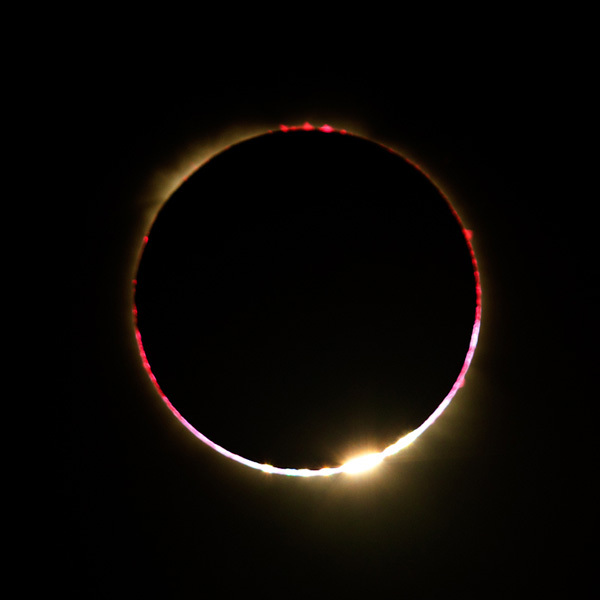 All too quickly, the Moon's shadow rushed past and a brilliant diamond ring apperared at the bottom of the Sun. 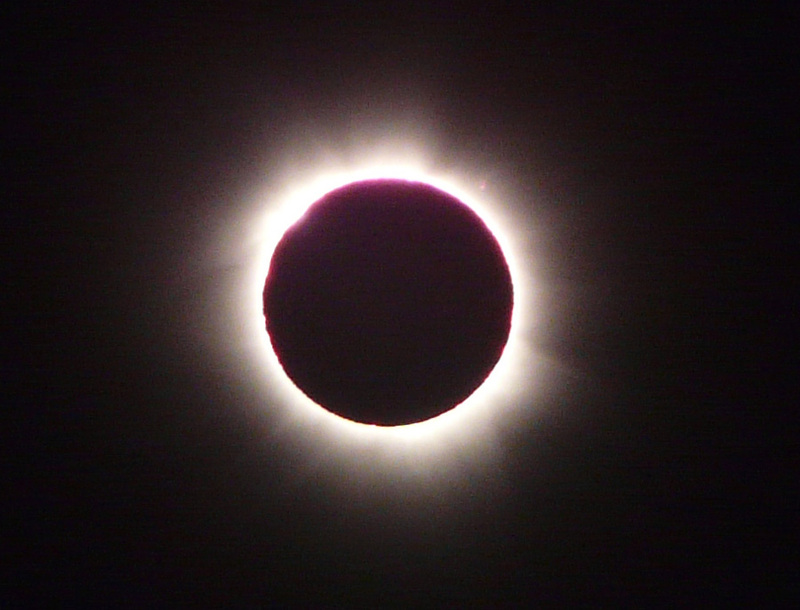 Totality had lasted a mere 22 seconds. But it had been darker than expected as the shadow was long in its direction of travel. I had captured the event on my camera. John and the 13 year old pupil (Fabian) had both managed to get a good diamond ring. Lindsey collected money from the eclipse chasers and I was asked to hand it over to the village elders which I did. I thanked them for their hospitality. They told me they now realised why we had come so far to see the eclipse. We returned to the lodge in darkness. The only traffic jam was at the entrance to the national park where some cars were getting stuck in flooded portion of the road and had to be pushed through. My 14th total eclipse of the Sun had been a success. Next one, Faroe Islands 2015. I spent a day in Entebbe where I visited the Botanical Gardens by Lake Victoria. I saw Vervet monkeys. At the Uganda Wildlife Education Centre I saw chimpanzees and the shoebill. At Bwindi Inpenetrable National Park (2340m) I saw a troop of mountain gorillas including a large silver backed male and a very young baby. On the way back to London, I had a 23 hour stop in Qatar. I visited the souk and the excellent Museum of Islamic Art. Sortly before the eclipse began we were joined by four green safari vehicles carrying a large group that included NASA's meteorology expert, Jay Anderson. They began setting up behind the school buildings. I had used Jay Anderson's eclipse weather reports for all my eclipses including this one. I met him and had my photo taken with him. As the Sun became blocked by the large cloud before totality, the group packed up and sped away looking for a better chance to experience totality. I later found out that they did see totality but in a location that gave them 10 seconds. I was informed that there were "a lot of Bailey's Beads". Written account and all text descriptions. (© 2013). All programming and photo editing. Shots of Totality. Pre and post Totality Sky. Organisation of safaris including drive to eclipse village. The 2013 eclipse main page. Maps of the path of the 2013 eclipse from Fred Espenak and eclipse details at the observation site. People from the 2013 eclipse. 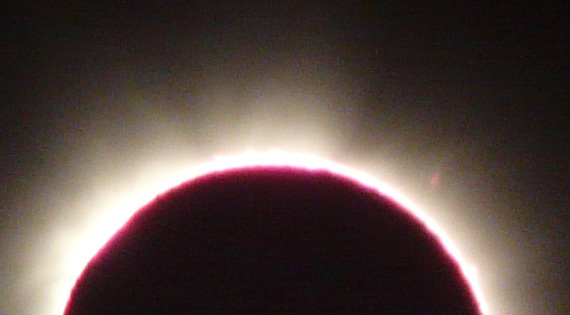 Accounts and photos of the eclipse. A local report including an interview with Kryss. 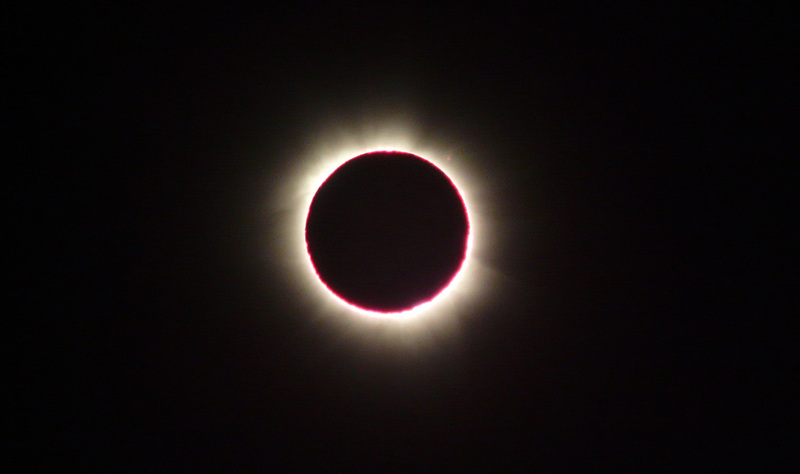 Video taken at Pokwero showing totality by Alex Gustafsson, who was in Lukasz's group. Kryss is in the yellow t-shirt on the right. 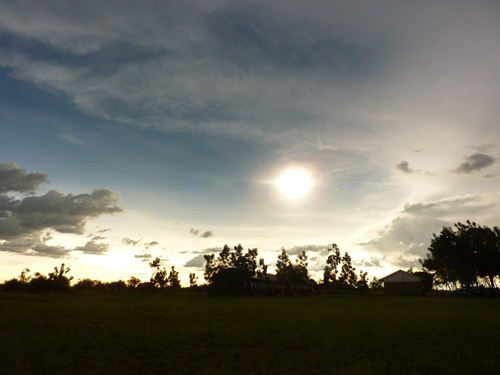 Account of the eclipse by Ugandan Tourism blogger, Charlotte Beauvoisin. 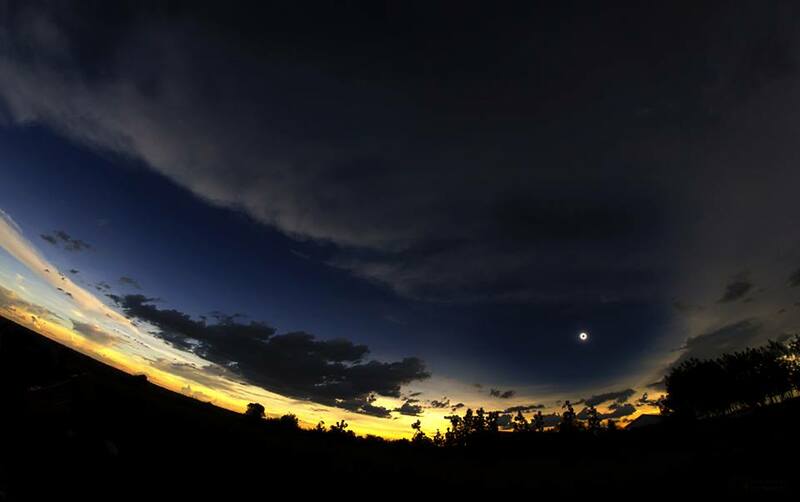 Japanese video showing totality at Nebbi about 30km from Pokwero.